"What these closings show is the general lack of protection in Quebec and it's also a Canada-wide problem, often at the whim of your franchisor," he said. Parkway Pontiac Buick in St. Laurent is one of the dealerships GM has decided to cut loose, and employees there can't understand why. MONTREAL — After teetering on the verge of bankruptcy 18 months ago, General Motors has made a major comeback, but one Montreal-area dealership isn't benefiting from the turnaround. The automotive company survived thanks to the help of the United States and Canadian governments and is now on the road to recovery with new models, paying back its debt and is soon to begin selling shares to the public again. 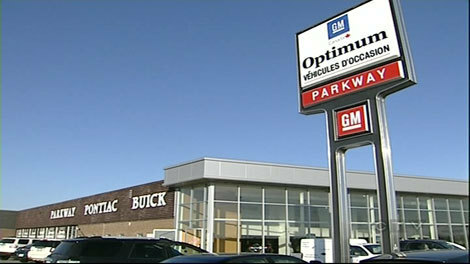 GM also decided to cut some dealerships loose at the height of the recession in mid-2009, including Parkway Pontiac Buick, a mainstay on the Trans-Canada Highway in Ville St. Laurent. "They never really said why, and from everything we have in our files we are one of the top performing dealers in Montreal," said Richard Hoy, general manager of Parkway Pontiac Buick. "Everybody here is really shaken up. It's been an awful situation to go through," he said. The dealership, which employs 89 people, is seeking to fight the closure in court. GM told CTV Montreal that Parkway was offered a settlement but turned it down, adding that, "GM has gone through a difficult period and some tough decisions had to be made." "They actually still have a high-profile dealership operating out of the same location so their decision was easier in this case. It was closer to a no-brainer," he said, adding that it is a symptom of a bigger problem.